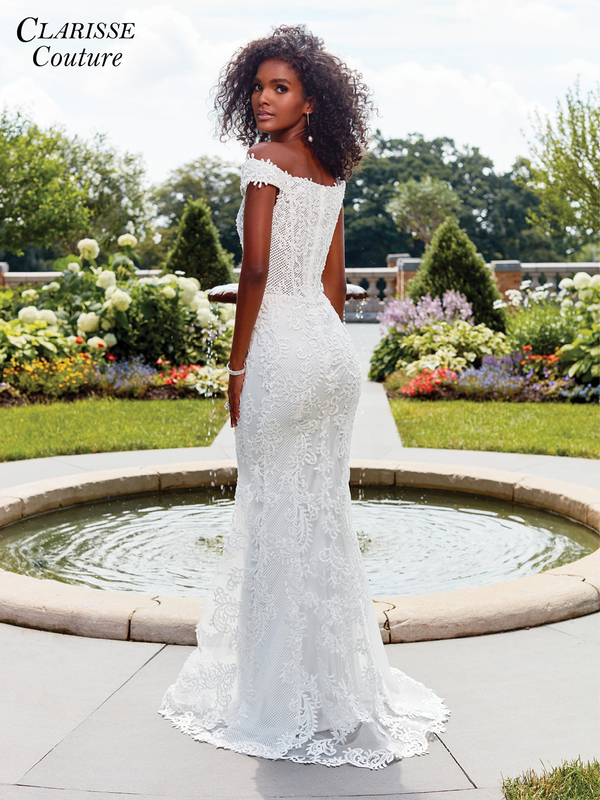 Look lovely in lace in Clarisse Couture 4969! Available in three classic colors, this gorgeous evening gown is perfect for your next formal event! The bodice features a romantic off the shoulder neckline, sheer net side panels and exposed boning for a flirty but not over the top detail. The skirt is made of net and lace, adorned with additional luxurious lace appliqu�s leading to a scallop edged hem. In white style 4969 would make a modern bridal gown and the Red would be a sultry and sophisticated prom dress, while the Navy would be perfect for a black tie gala or military ball. Center back zip closure, available in sizes 00 through 24 (Sizes 18 and up are an additional $25). PRODUCT REVIEWS FOR Couture Lace Evening Gown 4969 | 3 Colors!